We're honored to offer a limited edition line of notes inspired by the extraordinary artists of PeaceLove Studios. Founded in 2009 by Jeffrey Sparr and Matt Kaplan in Pawtucket, Rhode Island, PeaceLove is a growing movement and community of mental health advocates, artists, friends, families, students, teachers, corporations, and community leaders invested in conversations of acceptance, understanding and hope around mental illness. "Millions of Americans suffer from mental illness, often in silence," observes co-founder Matt Kaplan. 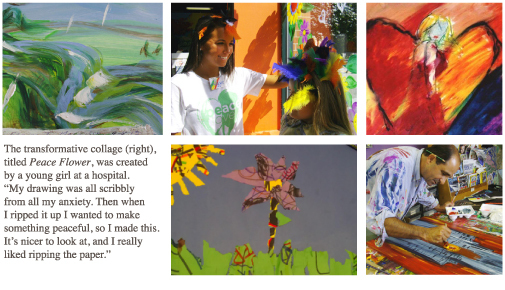 "PeaceLove offers a rallying cry for acceptance and solidarity through creative products, programs and spaces that inspire and celebrate the healing power of art. Through the sale of merchandise and the support of our partners, we've provided over 7,500 free Paint4Peace art workshops to communities in need throughout the Northeast, U.S. and Canada." Offering a wide variety of expressive arts courses and opportunities for personal growth and mental wellness, PeaceLove classes and workshops are open to everyone of any age or ability. The only skills required are the willingness to explore new things, interest in meeting new people and the desire to Create Peace of Mind™. "William Arthur is a shining example of an organization dedicated to working with us to create beautiful products that further conversations of acceptance and hope," Matt continues. "Every time an individual purchases and shares a PeaceLove card, we're one step closer to breaking down the stigma that negatively impacts too many." The complete collection of PeaceLove by William Arthur notes is on sale now through November 17th.